Update – August 25, 2017: Kits shipped after this date will be version AD01A. Electrically, this revision, is exactly the same as the original, prior, version. Changes include fixing the silkscreen to match the actual component values used, and shaping the board to give it the “Uno outline” (one side with the beveled contour). 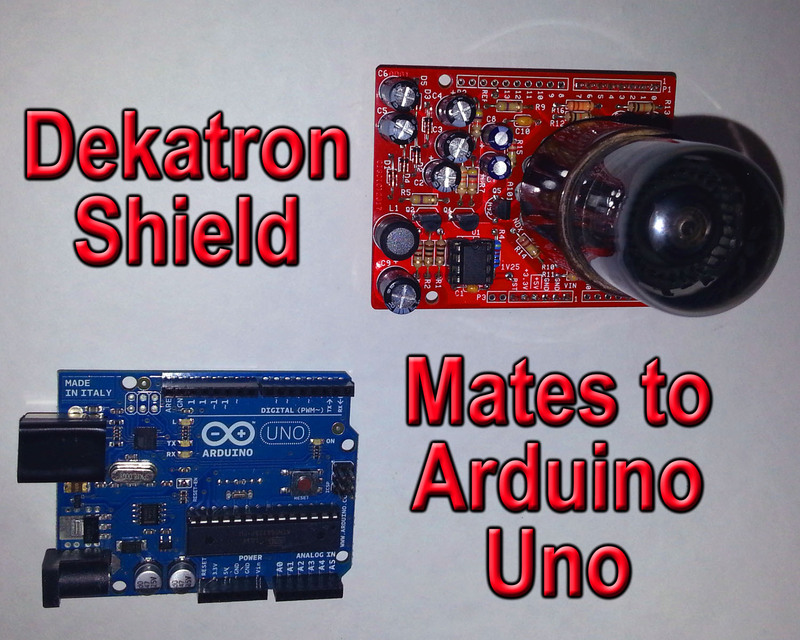 This is my first Arduino shield kit, and its intended to control a dekatron from an Arduino Uno. The shield board, itself, boosts the 5V power, from the USB connector, to ~420V, needed to power your common 2-guide neon filled standard speed dekatron. 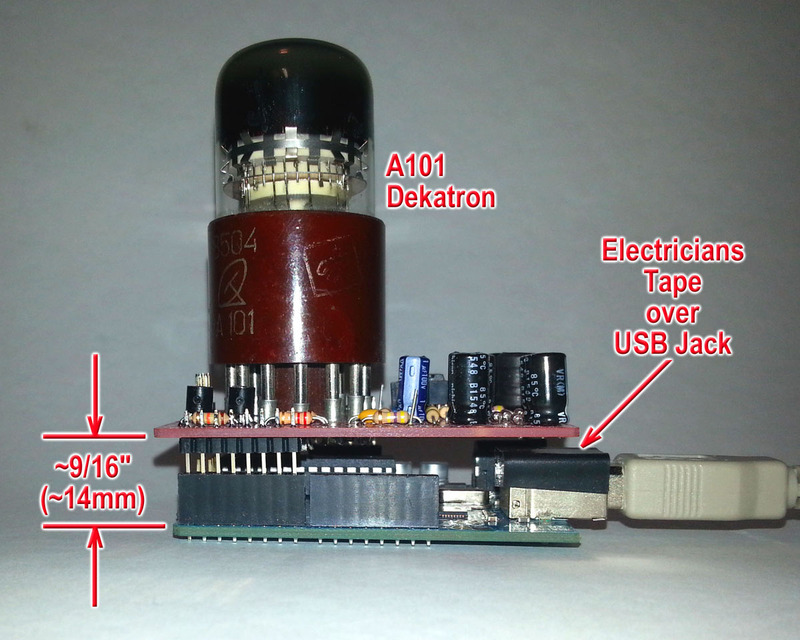 the board also contains a 13-pin socket which can hold an A-101 Russian dekatron. If you wish to control another type of dekatron, a 5-pin connector (J1), has also been provided. Only one dekatron can be powered and driven at one time. In addition to the 5V (as low as 3.75V) being provided by the attached Arduino Uno, only 3 IO signals are used to control the dekatron. These signals are: IO5 to G1, IO6 to G2, and IO7 to NDX. 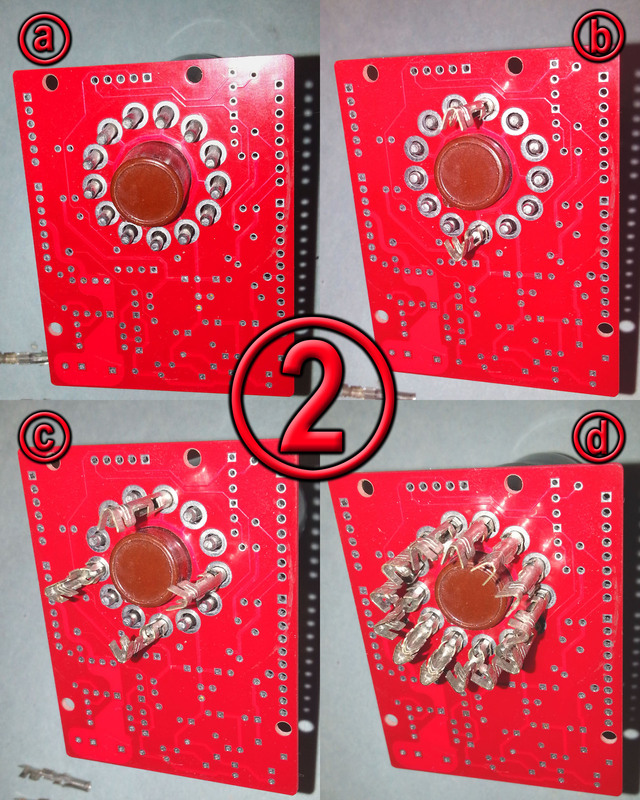 G1 & G2 (IO5 & IO6) are configured as outputs, from the Arduino, and digitalWrites control these “guide” signals (G1 & G2). IO7 is configured as an input, and is read from the Arduino using the digitalRead function. this input signal NDX (IO7), is high only when the glow resides at cathode K1, which lines up to pin 12 (or the A101 silkscreen) on the A101 dekatron. Use this input to keep track of the glows position. There are 30 3rd-steps per revolution. 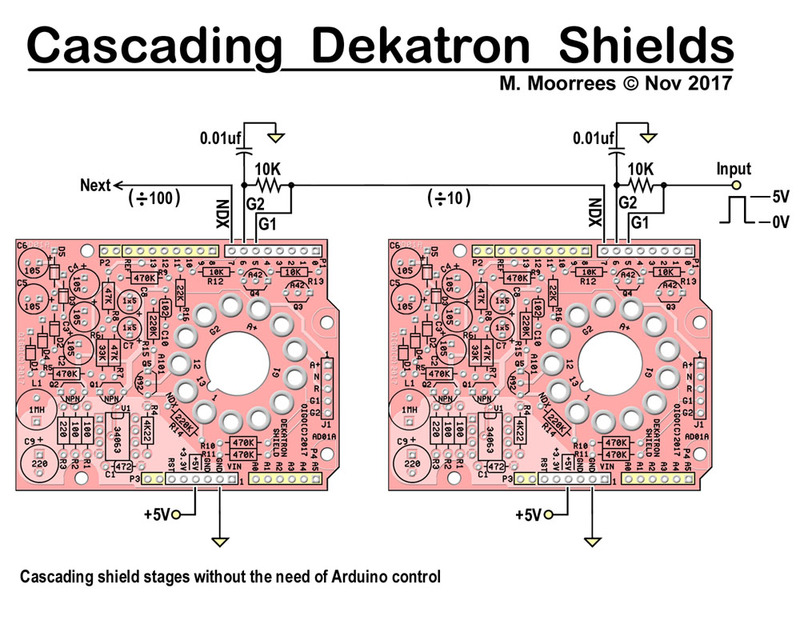 A 3rd-step to a dekatron is like a half-step for a stepper motor. The shield circuit, is quite simple. Most of it is the boost supply. Using your common MOSFET to switch the coil, doesn’t work to well, below ~6V. Instead, it has been found that regular NPN transistors (with decent saturation characteristics) work well at these low input voltages, in conjunction with larger inductors, and the resultant slower switching speeds. The paralleled 2N5551 transistors can handle upto 160V, so a design voltage of 140V was chosen. multiplying it, with a tripler circuit, yields a maximum of 420V, to strike the dekatron. A simple divider also makes the voltages G+ (~100V) and RTN (~50V), to bias the guides (G1 & G2), and main cathodes (K0 … K9), respectively. A guide signal (G1 or G2) will rest at 100V. When stepped (by turning either Q3 or Q4 ON) that guide will drop to near zero volts. Since the main cathodes, are up at 50V, the glow will transfer to the lower voltage, of the guide, which is 50V below (more negative), than the other cathodes. When the guides are at rest (both OFF), and the glow comes to rest at K1 (pin 13), which is connected to Q5’s emitter, Q5 will turn ON. Q5 is a MPSA92 PNP transistor. A glow at K1, will pass current into its emitter, which will raise its voltage over the RTN value, connected to its base. This will turn ON Q5, causing most of the current from the emitter, to flow out of its collector. This current will flow thru the divider formed by R15 & R16. Roughly 5V will be presented to the IO7 signal of the Arduino, which is a logic-1. When no current is flowing, R16 keeps IO7 at zero volts, or a logic-0. Remember, too, that the emitter of Q5, will be clamped to no more than ~0.7V, by its forward biased BE junction. All parts, with the exception of the dekatron, and Arduino, come with the kit. As Alway, before building the kit, check that all the parts (with a box in front) come with the kit. I do my best to be thorough and accurate, but mistakes are occasionally made. Contact me, at eBay, for any omitted parts, which I will provide at no further cost to you (since it was my mistake). 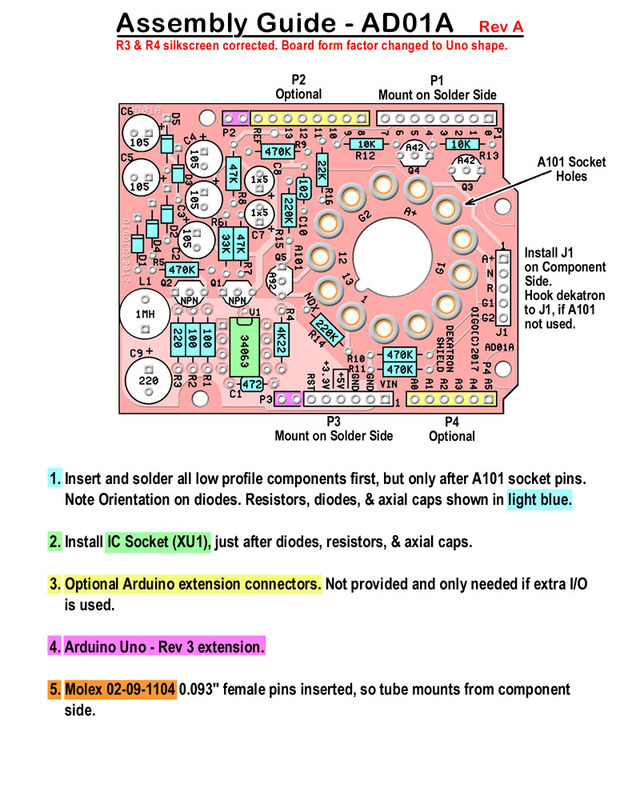 Note, only headers P1 & P3 are provided, and must be soldered onto the solder side of the board, while most of the parts, are mounted on the component side. Make sure all pins go all the way thru the board, to the other side. It may take a little wiggling to work all pins thru. 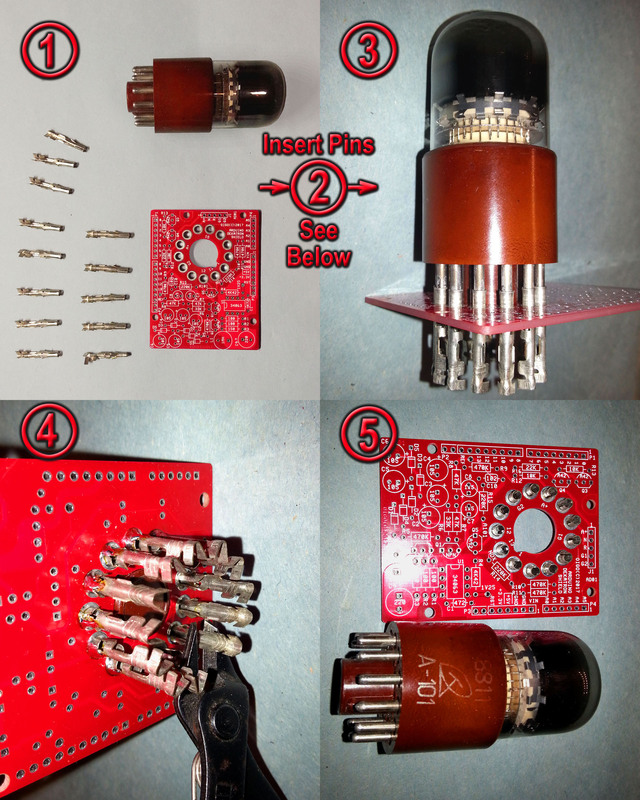 Once all pins are soldered (Solder side), and with the tube removed, trim down the pins, on the solder side, as flush as you can, without breaking its solder joint. Remember the A-101 is to be plugged in, on the component side (the side with the silkscreen). Its suggested that a small piece of electricians tape, be placed over the USB jack, of the Arduino, to prevent high voltage from shorting against it. Guide 1 is manipulated by performing a digitalWrite to IO port 5. Likewise, a digitalWrite to IO port 6 controls Guide 2. The NDX (index) signal is monitored by doing a digitalRead from IO port 7. Sample sketches can be downloaded here. Note sketches, Dekatron_t03i.ino thru Dekatron_Clock01.ino, need the TimerOne library uploaded to the library folder. This can be done by simply downloading, copying, and unzipping the file TimerOne-r11.zip. it can be found with the sample sketches.